At Nicole Miller Spring/Summer 2013, M·A·C Cosmetics worked with CND to bring us barely there makeup with super cool Galaxy Glam nails. According to WWD, lead makeup artist James Kaliardos “was inspired by technology and nature for the beauty look at Nicole Miller. The focal point was the eye, a “soft smoky” blend of four purple shades from MAC’s Spoiled Rich palette — launching in the spring — housed in “Archie”-comics-inspired packaging. “I’m trying to restrain myself this season,” said Kaliardos, who used Haute & Naughty Too Black on lashes. “I’m using color in a natural way.” To give skin contour and highlight, he utilized Prep + Prime Highlighter pens, Taupe Shape Blush, new for spring, and Mineralize Moisture SPF 15 Foundation, which launches in fall 2013. Lips were kept neutral, with Posh Tone Mineralize Lipstick, also new for fall 2013.”. 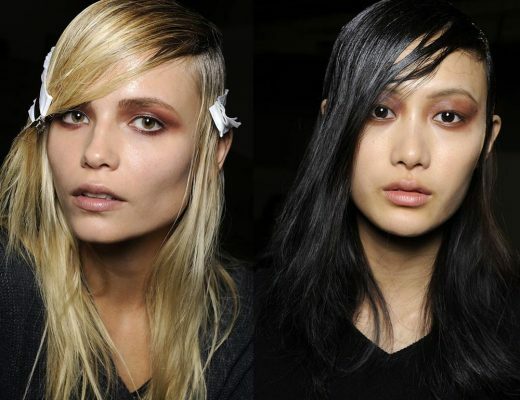 See James talks briefly about the look for the show and the trends for Spring 2013 below. Created by Candice Manacchio, the manicure was concocted with a custom blended mint green overlapped with sporadically sponged-on CND Sapphire Sparkle Effect, CND Colour in Studio White and a pink shade from launching in late Spring 2013. Each nail was edged out with CND Colour in Blackjack for a modern twist. James Kaliardos, for MAC, was inspired by technology and nature for the beauty look at Nicole Miller. The focal point was the eye, a “soft smoky” blend of four purple shades from MAC’s Spoiled Rich palette — launching in the spring — housed in “Archie”-comics-inspired packaging. “I’m trying to restrain myself this season,” said Kaliardos, who used Haute & Naughty Too Black on lashes. “I’m using color in a natural way.” To give skin contour and highlight, he utilized Prep + Prime Highlighter pens, Taupe Shape Blush, new for spring, and Mineralize Moisture SPF 15 Foundation, which launches in fall 2013. Lips were kept neutral, with Posh Tone Mineralize Lipstick, also new for fall 2013. Those nails are just amazing! Gotta love them!